I YPlacida is one of the nicest places I’ve ever flown. Forty years ago it was one mans dream of riches and paradise and another mans real estate nightmare. Ever hear? …….I’ve got swamp land in Florida that’s going to make us both rich”. These days, it’s just miles of open land with nothing but narrow ribbons of asphalt that that were to be the streets of a community that was never built. Truly a PPG Trike paradise, nice little runways in all directions. No curbs trying to catch wheel and no wires waiting to pluck you from the sky. No matter which way the wind is blowing, it’s a simple matter to set up in a cul de sac so that you have a the first hundred feet into the wind. Today was special because in was blowing right down the road. I was able to inflate the wing and stay on the asphalt until I’d built enough speed that the wing literally jumped into the air. Today’s mission was to fly the arrow cam through some moderately steep turns both under power and without. 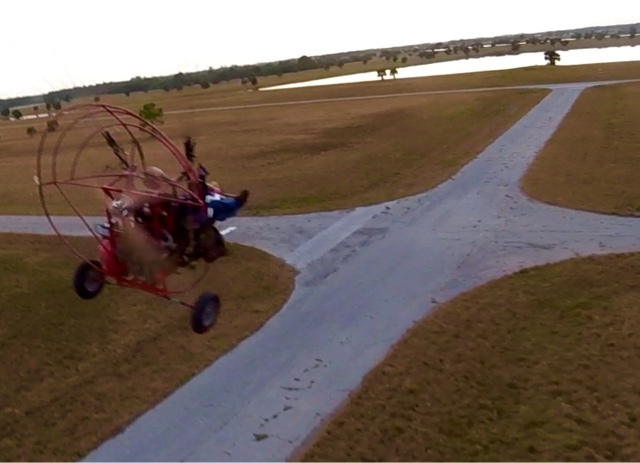 The idea was to figure out how the Paramotor would be framed during different manuvers and depending on whether the cam was on the inside or the outside of the turn. As far as videos go, it’s a real stinker, I spiced it up with a great Lannie Garrett song to make it tolerable. so…. This movie is all about the soundtrack. Technical note …. 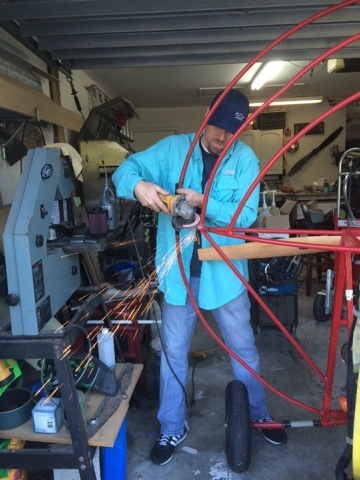 The cage had a weld break loose which Mike Lange graciously repaired in short order. When it happened I felt it ! 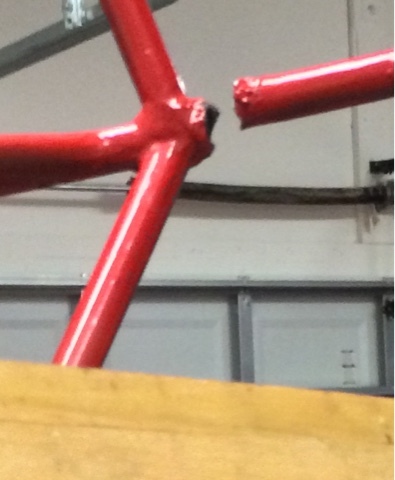 I didn’t know what it was but I sensed something and the first thing I did after landing was grab the frame to give it a shake and there was the break, right there in my hand. I spoke with Terry about the belt which I’m thinking should be replaced. He told me to measure the center to center of the hubs if I could not find the numbers. Well dispite not seeing them the last time I looked, there they were, big as hell.